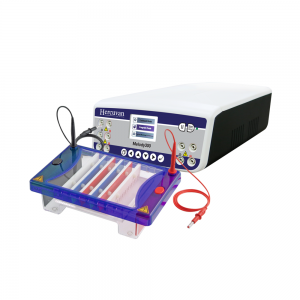 ConcertoGEL Classic/ Classic Trio / Classic XL Horizontal Gel Electrophoresis System are wide format system with 2-3 times sample capacity as ConcertoGEL Midi unit, primarily designed for routine and rapid horizontal gel electrophoresis and restriction fragment analysis with optimum versatility and flexibility. ConcertoGEL Classic is available with three gel tray options of 15 x 7 cm, 15 x 10 cm and 15 x 15 cm. Restriction fragment and close MW samples can be easily analysed with the 15 cm total run length, which permits sufficient band separation. It allows rapid gel resolution for up to 210 samples with maximized comb and tray options. Furthermore, the 10, 14, 16, 18, 28 or 30 multichannel pipette compatible combs prevent time-consuming loading of samples. 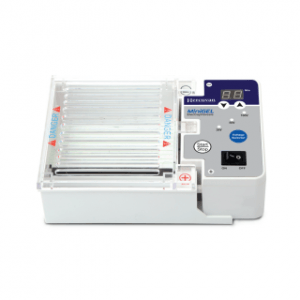 Another model, ConcertoGEL Classic XL allows higher resolution separation of greater sample number from 96-well microplates and blocks over a longer distance with optional 15 x 20 cm and 15 x 25 cm gel trays together with four 28-sample combs. ConcertoGEL Classic Trio includes all 3 tray sizes for optimum versatility and economic of scale.